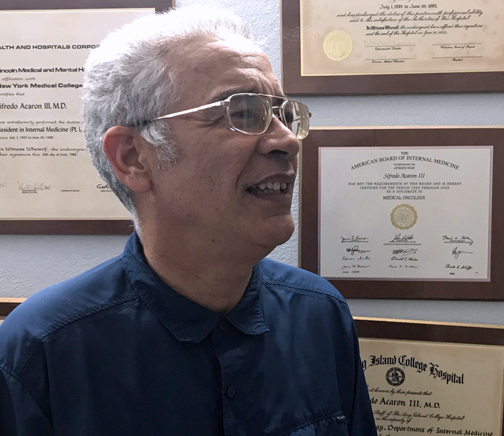 Sifredo Acarón, a hematologist-oncologist based in Mayagüez. Sifredo Acarón, a hematologist-oncologist based in Mayagüez, filed a lawsuit against healthcare insurer Triple-S Salud Inc. and Triple-S Medicare Advantage Inc. for canceling his contract effective June 30. In the complaint filed in San Juan Superior Court, the physician seeks a temporary and permanent injunction against the provider for its action, which he claims was done without allowing for a contractual appellative process to review the determination. Acarón, who has been seeing patients for more than 30 years in his office in Mayagüez, said the insurer’s decision will also represent an “incalculable impact” for the Perea Hospital Oncology Department, which he also heads. “My treatment is personalized and individualized. These are human beings whom I treat as a family. My goal is that the experience they have, in itself difficult, will become more bearable and human,” said Acarón. Acarón is one of the few hematologists-oncologists who treats all populations, including Government Health Reform patients. His case “dramatically illustrates the clash of visions in healthcare, in which insurers have absolute control of the management of people’s health,” he said in a statement. “Situations like this are those faced daily by general practitioners and all specialties, and many prefer to close their practices and leave the island,” Acarón’s representatives said. With his lawsuit, Acarón seeks to shed light on the processes and decisions that are made behind closed doors and without explanations that continue to undermine the quality and supply of health services on the island. “This case focuses on Acarón, who is a specialist of relevance and importance in the island, but its impact can be much greater, because this is not even remotely an isolated matter, as it is public knowledge. At some point, doctors and patients have to take action for their rights, without fear and relying on the justice system,” said Montalvo. In the suit, the defendant asks the Court to issue an order for temporary injunction to freeze a June 28 hearing Triple-S granted to review its decision, giving the physician 30 minutes to present his arguments and evidence against the contract cancellation, two days before it is scheduled to end. Hey Buddy!, I found this information for you: "Mayagüez MD sues Triple-S for ‘endangering’ patients". Here is the website link: https://newsismybusiness.com/mayaguez-endangering-patients/. Thank you.